This article is about the city in Devon. For the Massachusetts town, see Plymouth, Massachusetts. For other uses, see Plymouth (disambiguation). 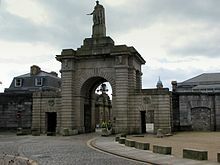 Plymouth (/ˈplɪməθ/ ( listen)) is a port city situated on the south coast of Devon, England, approximately 37 miles (60 km) south-west of Exeter and 190 miles (310 km) west-south-west of London. Enclosing the city are the mouths of the river Plym and river Tamar, which are naturally incorporated into Plymouth Sound to form a boundary with Cornwall. Upper Palaeolithic deposits, including bones of Homo sapiens, have been found in local caves, and artefacts dating from the Bronze Age to the Middle Iron Age have been found at Mount Batten, showing that it was one of few principle trading ports of pre Roman Britannia dominating continental trade with Armorica. An unidentified settlement named TAMARI OSTIA (mouth/estuaries of the Tamar) is listed in Ptolemy's Geographia and is presumed to be located in the area of the modern city. An ancient promontory fort was located at Rame Head at the mouth of Plymouth Sound with ancient hillforts located at Lyneham Warren to the east , Boringdon Camp and Maristow Camp  to the north . Throughout the 17th century Plymouth had gradually lost its pre-eminence as a trading port. By the mid-17th century, commodities manufactured elsewhere in England cost too much to transport to Plymouth, and the city had no means of processing sugar or tobacco imports, major products from the colonies. Local sailors turning to piracy such as Henry Every became infamous, celebrated in the London play The Successful Pyrate. It played a part in the Atlantic slave trade during the early 18th century, although it was relatively small. Royal William Victualling Yard, Stonehouse by Sir John Rennie,1825–33. 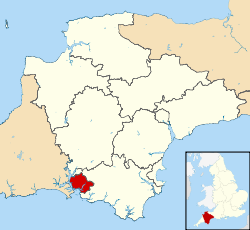 In the Parliament of the United Kingdom, Plymouth is represented by the three constituencies of Plymouth Moor View, Plymouth Sutton and Devonport and South West Devon and within the European Parliament as South West England. In the 2017 general election the city two returned Conservative MPs, who were Gary Streeter (for South West Devon) and Johnny Mercer (for Moor View), and one Labour MP, Luke Pollard (for Sutton and Devonport), . The City of Plymouth is divided into 20 wards, 17 of which elect three councillors and the other three electing two councillors, making up a total council of 57. Each year a third of the council is up for election for three consecutive years – there are no elections on the following "fourth" year, which is when County Council elections take place. The total electorate for Plymouth was 188,924 in April 2015. The local election of 7 May 2015 resulted in a political composition of 28 Labour councillors, 26 Conservative and 3 UKIP resulting in a Conservative UKIP coalition administration. 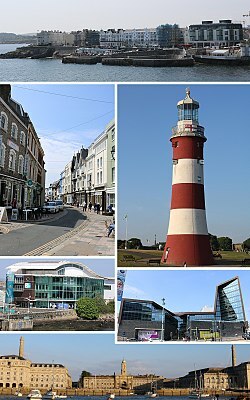 Plymouth City Council is formally twinned with: Brest, France (1963), Gdynia, Poland (1976), Novorossiysk, Russia (1990) San Sebastián, Spain (1990) and Plymouth, United States (2001). Along with the rest of South West England, Plymouth has a temperate oceanic climate (Köppen Cfb) which is generally wetter and milder than the rest of England. This means a wide range of exotic plants can be grown. The annual mean temperature is approximately 11 °C (52 °F). Due to the modifying effect of the sea and the southwesterly location, the climate is among the mildest of British cities and the seasonal range is less than in most other parts of the UK. As a result of this summer highs are lower than points further north in the UK; however, the coldest month of February has mean minimum temperatures as mild as between 3 and 4 °C (37 and 39 °F). Snow is rare, not usually equating to more than a few flakes, but there have been exclusions, namely the European winter storms of 2009-10 which, in early January, covered Plymouth in at least 1 inch (2.5 cm) of snow; more on higher ground. Another period of notable snow occurred from 17–19 December 2010 when up to 8 inches (20 cm) of snow fell through the period – though only 2 inches (5.1 cm) would lie at any one time due to melt. Over the 1961–1990 period, annual snowfall accumulation averaged less than 7 cm (3 in) per year. July and August are the warmest months with mean daily maxima over 19 °C (66 °F). The University of Plymouth enrolls 23,155 total students as of 2018/2019 (38th largest in the UK out of 167). It also employs 2,900 staff with an annual income of around £160 million. It was founded in 1992 from Polytechnic South West (formerly Plymouth Polytechnic) following the Further and Higher Education Act 1992. It has a wide range of courses including those in marine focused business, marine engineering, marine biology and Earth, ocean and environmental sciences, surf science, shipping and logistics. 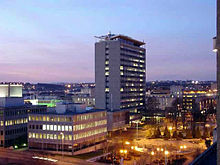 The university formed a joint venture with the fellow Devonian University of Exeter in 2000, establishing the Peninsula College of Medicine and Dentistry. The college is ranked 8th out of 30 universities in the UK in 2011 for medicine. Its dental school was established in 2006, which also provides free dental care in an attempt to improve access to dental care in the South West. A scheme is in operation over summer 2018 to provide meals during the summer holidays for children with parents on low income, the parents cannot afford to provide their children with healthy meals. UPSU also known as the University of Plymouth Student Union is based underground near the library. Every student at the University of Plymouth is an member of UPSU. The Union employs students across the University, from bar staff to events technicians. Every year the students at the University have an opportunity to vote which sabbatical officers represents them. In 2019 over 4000 students voted in the UPSU elections. 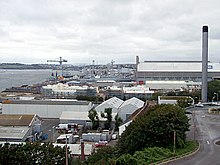 HMNB Devonport – the largest operational naval base in Western Europe. Because of its coastal location, the economy of Plymouth has traditionally been maritime, in particular the defence sector with over 12,000 people employed and approximately 7,500 in the armed forces. The Plymouth Gin Distillery has been producing Plymouth Gin since 1793, which was exported around the world by the Royal Navy. During the 1930s, it was the most widely distributed gin and has a controlled term of origin until 2015. Since the 1980s, employment in the defence sector has decreased substantially and the public sector is now prominent particularly in administration, health, education, medicine and engineering. The city's airport was Plymouth City Airport about 4 miles (6 km) north of the city centre. The airport was home to the local airline Air Southwest, which operated flights across the United Kingdom and Ireland. In June 2003, a report by the South West RDA was published looking at the future of aviation in the south-west and the possible closure of airports. It concluded that the best option for the south-west was to close Plymouth City Airport and expand Exeter International Airport and Newquay Cornwall Airport, although it did conclude that this was not the best option for Plymouth. In April 2011, it was announced that the airport would close, which it did on 23 December. FlyPlymouth put forward plans to reopen the city airport by 2018, providing daily services to various destinations including London. There is a proposal to reopen the Exeter to Plymouth railway of the LSWR which would connect Cornwall and Plymouth to the rest of the UK railway system on an all weather basis. There are proposals to reopen the line from Tavistock to Bere Alston for a through service to Plymouth. On the night of 4 February 2014, amid high winds and extremely rough seas, part of the sea wall at Dawlish was breached washing away around 40 metres (130 ft) of the wall and the ballast under the railway immediately behind. The line was closed. Network Rail began repair work and the line reopened on 4 April 2014. In the wake of widespread disruption caused by damage to the mainline track at Dawlish by coastal storms in February 2014, Network Rail are considering reopening the Tavistock to Okehampton and Exeter section of the line as an alternative to the coastal route. Plymouth is at the southern end of the 99-mile (159 km) long Devon Coast to Coast Cycle Route (National Cycle Route 27). The route runs mostly traffic free on off-road sections between Ilfracombe and Plymouth. The route uses former railway lines, though there are some stretches on public roads. Plymouth is home to Plymouth Argyle F.C., who play in the third tier of English football league known as Football League One. The team's home ground is called Home Park and is located in Central Park. It links itself with the group of English non-conformists that left Plymouth for the New World in 1620: its nickname is "The Pilgrims". The city also has three Non-League football clubs; Plymouth Parkway who play at Bolitho Park, Elburton Villa who play at Haye Road and Plymstock United who play at Dean Cross. Plymouth Parkway were recently[when?] promoted to the Western League from the South West Peninsula League, whilst Elburton Villa and Plymstock United continue to compete in the South West Peninsula League. After the English Civil War the Royal Citadel was erected in 1666 towards the eastern section of Plymouth Hoe, to defend the port from naval attacks, suppress Plymothian Parliamentary leanings and to train the armed forces. Currently, guided tours are available in the summer months. Further west is Smeaton's Tower, which is a standard lighthouse that was constructed in 1759. 14 miles (23 km) Furthermore, Smeaton’s Tower was dismantled in 1877 and the top two thirds were reassembled on Plymouth Hoe. It is open to the public and has views over the Plymouth Sound and the city from the lantern room. Plymouth has 20 war memorials of which nine are on The Hoe including: Plymouth Naval Memorial, to remember those killed in World Wars I and II, and the Armada Memorial, to commemorate the defeat of the Spanish Armada. Beckley Point, at 78m / 20 floors, is Plymouth's tallest building  and was completed on 8 February 2018. It was designed by Boyes Rees Architects and built by contractors Kier. Antarctic explorers Robert Falcon Scott and Frank Bickerton both lived in the city. Artists include Beryl Cook whose paintings depict the culture of Plymouth and Robert Lenkiewicz, whose paintings investigated themes of vagrancy, sexual behaviour and suicide, lived in the city from the 1960s until his death in 2002. Illustrator and creator of children's series Mr Benn and King Rollo, David McKee, was born and brought up in South Devon and trained at Plymouth College of Art. Jazz musician John Surman, born in nearby Tavistock, has close connections to the area, evidenced by his 2012 album Saltash Bells. The avant garde prepared guitarist Keith Rowe was born in the city before establishing the jazz free improvisation band AMM in London in 1965 and MIMEO in 1997. The musician and film director Cosmo Jarvis has lived in several towns in South Devon and has filmed videos in and around Plymouth. In addition, actors Sir Donald Sinden and Judi Trott were born in Plymouth. George Passmore of Turner Prize winning duo Gilbert and George was also born in the city, as was Labour politician Michael Foot whose family reside at nearby Trematon Castle. ^ Weather station is located 1.6 miles (2.6 km) from the Plymouth city centre. ^ a b c d "Brief history of Plymouth". Plymouth City Council. Retrieved 20 July 2008. ^ a b "The Lord Mayor". Plymouth City Council. Retrieved 2 December 2015. ^ a b "Standard Area Measurements (2016) for Administrative Areas in the United Kingdom". Office for National Statistics. 1 February 2017. Retrieved 9 February 2017. ^ Andrew T. Chamberlain; Keith W. Ray; Charlotte Henderson; Richard Welton Fisher (1994). A Catalogue of Quaternary Fossil-bearing Cave Sites in the Plymouth Area. Plymouth City Archaeology. ISBN 1-85522-345-7. ^ Historic England. "Mount Batten (1017598)". National Heritage List for England. Retrieved 30 March 2019. ^ Cunliffe, Barry (2004). "Britain and the Continent:Networks of Interaction". In Malcolm Todd (ed.). A Companion to Roman Britain. Blackwell Publishing. p. 3. ISBN 0-631-21823-8. Retrieved 23 June 2008. ^ Denis Larionov & Alexander Zhulin. "Read the ebook Geographia classica, or, The application of antient geography to the classics by Samuel Butler". Ebooksread.com. Retrieved 17 September 2012. ^ a b c d e f g "The early history of Plymouth". Plymouth City Council. Archived from the original on 9 June 2008. Retrieved 19 July 2008. ^ Moseley, Brian (24 June 2013). "Place Names". The Encyclopaedia of Plymouth History. Plymouth Data. Archived from the original on 27 September 2013. Retrieved 13 February 2015. ^ Sumption, Jonathan (1999). "Sluys and Tournai: The War of the Alberts". The Hundred Years War: Trial by Battle. University of Pennsylvania Press. p. 347. ISBN 0-8122-1655-5. Retrieved 29 June 2008. ^ "Devon timeline". Devon County Council. Archived from the original on 5 May 2008. Retrieved 29 June 2008. ^ "Plymouth City Council: coat of arms". ^ a b "Slave Ships in Plymouth". Plymouth City Council. Archived from the original on 9 June 2008. Retrieved 26 July 2008. ^ "Adventurers and Slavers". The National Archives. Retrieved 13 October 2007. ^ a b "Sir Francis Drake". The BBC. Retrieved 24 July 2008. ^ Kellogg, William O. (2003). American History the Easy Way: The Easy Way. Barron's Educational Series (3rd ed.). Hauppauge, N.Y.: Barron's. p. 20. ISBN 0-7641-1973-7. Retrieved 14 November 2008. ^ a b c "Siege". The BBC. 6 January 2003. Retrieved 6 July 2008. ^ Jenny Mashford. "Plymouth City Council – Freedom Fields Park". Archived from the original on 28 July 2014. ^ a b "Coast Walks: Point 3 – The Citadel". The BBC. 25 January 2008. Retrieved 5 July 2008. ^ Jewitt, Llewellynn Frederick (1873). A history of Plymouth. Oxford University. p. 648. ^ Carrington, Henry Edmund (1828). The Plymouth and Devonport guide. Oxford University. p. 1. Retrieved 5 July 2008. ^ "Cargo and Trade, Ocean Landing Pier" (PDF). Plymouth City Museum and Art Gallery. Archived from the original (PDF) on 11 June 2008. Retrieved 26 July 2008. ^ a b Moseley, Brian (3 December 2011). "John Foulston (1772–1842)". The Encyclopaedia of Plymouth History. Plymouth Data. Archived from the original on 15 May 2012. Retrieved 13 February 2015. ^ "Devonport, Devon". Architecture.com. Archived from the original on 18 May 2013. Retrieved 17 September 2012. ^ "Information Sheet: Cookworthy's Plymouth Porcelain" (PDF). Plymouth City Council. Archived from the original (PDF) on 4 March 2016. Retrieved 23 April 2016. ^ Moseley, Brian (26 February 2013). "Breakwater". The Encyclopaedia of Plymouth History. Plymouth Data. Archived from the original on 17 May 2013. Retrieved 13 February 2015. ^ Moseley, Brian (21 January 2011). "Palmerston's Forts and Batteries". The Encyclopaedia of Plymouth History. Plymouth Data. Archived from the original on 17 May 2013. Retrieved 13 February 2015. ^ Moseley, Brian (25 August 2012). "Imports (Port of Plymouth)". The Encyclopaedia of Plymouth History. Plymouth Data. Archived from the original on 28 September 2013. Retrieved 13 February 2015. ^ a b "Characteristics of the City of Plymouth (Historical and industrial legacy)". Plymouth City Council. Archived from the original on 9 June 2008. Retrieved 24 July 2008. ^ a b Moseley, Brian (21 February 2013). "The Great War, 1914–1918". The Encyclopaedia of Plymouth History. Plymouth Data. Archived from the original on 28 November 2013. Retrieved 13 February 2015. ^ "D-Day In Plymouth, Uk, And American Infantry". Cyber-heritage.co.uk. Retrieved 17 September 2012. ^ "Frosty response to church climb". BBC News. 17 November 2005. Retrieved 22 November 2008. ^ a b c d Gould, Jeremy (2010). Plymouth; Vision of a Modern City. English Heritage. 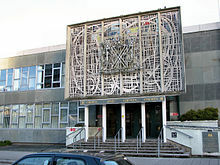 ^ "Sale of Plymouth Civic Centre". English Heritage. 15 October 2010. Retrieved 17 September 2012. ^ "The hundreds of devon". GENUKI. Retrieved 18 June 2011. ^ "List of Mayors and Lord Mayors from 1439 to date". Plymouth City Council. Retrieved 8 December 2008. ^ "Three Towns Amalgamation". The Times. UK. 9 February 1914. ^ "The City of Plymouth". The Times. UK. 18 October 1928. ^ "South West Regional Office of the Labour Party archives". The National Archives. 21 March 1972. pp. 38423/32. Retrieved 20 July 2008. ^ Department of the Environment (18 July 1996). The Devon (City of Plymouth and Borough of Torbay) (Structural Change) Order 1996. Office of Public Sector Information. ISBN 0-11-062779-2. Retrieved 26 July 2008. ^ "Elected representatives". Plymouth City Council. Archived from the original on 9 June 2008. Retrieved 1 September 2008. ^ a b "Plymouth wards". Plymouth City Council. Retrieved 27 October 2009. ^ "Electorate details, register statistics and annual performance". Plymouth City Council. Archived from the original on 8 December 2015. Retrieved 2 December 2015. ^ "About Plymouth City Council". Plymouth City Council. Retrieved 2 December 2015. ^ "Twin towns". Plymouth City Council. Retrieved 6 June 2015. ^ a b "Lord Mayoralty". Plymouth City Council. Retrieved 2 December 2015. ^ a b "Elliot Terrace". Plymouth City Council. Archived from the original on 10 February 2008. Retrieved 16 February 2008. ^ "Council opposes building listing". BBC News. 10 July 2007. Retrieved 20 November 2008. ^ a b c "Devon's rivers: The Tamar". The BBC. 6 February 2008. Retrieved 8 July 2008. ^ Otter, R. A. (1994). "The Tamar Valley and Plymouth". Civil Engineering Heritage: Southern England. Thomas Telford. p. 48. ISBN 0-7277-1971-8. Retrieved 8 July 2008. ^ Report and Transactions. 9. Devonshire Association for the Advancement of Science. 1877. p. 426. Retrieved 11 July 2008. ^ "Characteristics of the City of Plymouth (The geography)". Plymouth City Council. Archived from the original on 9 June 2008. Retrieved 25 July 2008. ^ a b c d e "Characteristics of the City of Plymouth (The geology)". Plymouth City Council. Archived from the original on 9 June 2008. Retrieved 26 July 2008. ^ "Plymouth Sound Shores and Cliffs" (PDF). Natural England. Archived from the original (PDF) on 18 December 2008. Retrieved 27 November 2008. ^ "Characteristics of the City of Plymouth (Limestone)". Plymouth City Council. Archived from the original on 9 June 2008. Retrieved 26 July 2008. ^ a b c "A vision for Plymouth". plymouth.gov.org. Plymouth City Council. Archived from the original on 9 June 2008. Retrieved 20 February 2008. ^ a b "Parks and open spaces". Plymouth City Council. Archived from the original on 9 June 2008. Retrieved 1 September 2008. ^ "Central Park". Plymouth City Council. Archived from the original on 9 June 2008. Retrieved 17 February 2009. ^ a b c "About south-west England". The Met Office. Archived from the original on 25 February 2006. Retrieved 28 May 2006. ^ "Climatological Normals of Plymouth – 1961–1990". NOAA. Retrieved 9 June 2011. ^ "Climatological Normals of Plymouth – 1961–1990". Climatological Information for United Kingdom and Ireland. The Hong Kong Observatory. Retrieved 9 June 2008. ^ "Average warmest day". Retrieved 9 June 2011. ^ "1976 High". Retrieved 9 June 2011. ^ ">25.1c days". Retrieved 9 June 2011. ^ "Average coldest night". Retrieved 9 June 2011. ^ "1979 minimum". Retrieved 9 June 2011. ^ "Frost average". Retrieved 9 June 2011. ^ "Plymouth 1981–2010 averages". Met Office. Retrieved 7 March 2019. ^ "Plymouth–Mount Batten climate normals 1961–1990". NOAA. Retrieved 21 March 2019. ^ "Indices Data - Plymouth:MountBatten Station 1814". KNMI. Retrieved 7 March 2019. ^ a b "University of Plymouth – an introduction". The University of Plymouth. Retrieved 16 November 2008. ^ "Our history". The University of Plymouth. Retrieved 10 July 2016. ^ "Undergraduate courses A-Z". The University of Plymouth. Retrieved 18 June 2008. ^ "University guide 2011: Medicine". The Guardian. UK. 8 June 2010. Retrieved 13 November 2010. ^ "The History of the University College". The University College Plymouth St Mark & St John. Retrieved 19 June 2008. ^ "The College". City College Plymouth. Retrieved 19 June 2008. ^ "Plymouth College of Art home page". Plymouth College of Art. Retrieved 19 June 2008. ^ "Schools". Plymouth City Council. Retrieved 19 June 2008. ^ Moseley, Brian (1 March 2007). "Royal Naval Engineering College HMS Thunderer". The Encyclopaedia of Plymouth History. Plymouth Data. Archived from the original on 6 November 2010. Retrieved 13 February 2015. ^ "The Plymouth Marine Laboratory". South West England RDA. Retrieved 12 December 2008. ^ a b c "Ethnic Group, 2011". Office for National Statistics. 30 January 2013. Retrieved 17 July 2013. ^ "Plymouth UA". Census 2001. The Office for National Statistics. Retrieved 15 February 2008. ^ "Household Size, 2011". Office for National Statistics. 30 January 2013. Retrieved 17 July 2013. ^ "Household Composition – People, 2011". Office for National Statistics. 30 January 2013. Retrieved 17 July 2013. ^ "Ethnic Group, 2001". Office for National Statistics. 18 November 2004. Retrieved 17 July 2013. ^ a b "Regional GVA NUTS3" (Excel). Office for National Statistics. December 2014. Retrieved 3 June 2015. ^ "All people – Economically active – Unemployed (Model Based) Plymouth" (PDF). The Office for National Statistics. Retrieved 3 June 2015. ^ "Health Profile 2014 Plymouth". National Health Service. August 2014. Retrieved 3 June 2015. ^ a b "HMNB Devonport". The Royal Navy. Retrieved 18 September 2013. ^ "Plymouth's proud naval history". BBC Devon. ^ a b c "Business and economy". Plymouth City Council. Archived from the original on 9 June 2008. Retrieved 17 July 2008. ^ a b Andrews, Robert (2004). The Rough Guide to Devon & Cornwall. Peter Hack, Kate Hughes, Bea Uhart (2 ed.). Rough Guides. p. 139. ISBN 978-1-84353-312-2. Retrieved 26 July 2009. ^ "Marine Sector". Plymouth City Council website. The University of Plymouth. Archived from the original on 15 October 2007. Retrieved 22 July 2008. ^ "History of pannier market". Plymouth City Council. Retrieved 16 February 2008. ^ "Town Centre Performance & Retail Ranking Update, May 2007" (PDF). South West Regional Board. Retrieved 16 February 2008. ^ "Facts and figures". Plymouth City Council. Archived from the original on 10 February 2008. Retrieved 20 February 2008. ^ "Established BIDs". National BIDs Advisory Service. Retrieved 16 February 2008. ^ "Point 6 – Tinside Pool". The BBC. 25 January 2008. Retrieved 16 November 2008. ^ a b "Controversy over £200m shops plan". BBC News. 5 October 2006. Retrieved 13 October 2007. ^ Laing, Jemima (5 October 2006). "Changing perceptions of Plymouth". BBC News. Retrieved 15 November 2008. ^ "Civic centre demolition backed". BBC News. 25 September 2007. Retrieved 15 November 2008. ^ "Dock regeneration plan boosted". BBC News. 19 December 2002. Retrieved 29 June 2008. ^ Ordnance Survey. (3 October 2005). Lower Tamar Valley & Plymouth. Ordnance Survey. ISBN 0-319-23527-0. Retrieved 16 November 2008. ^ "Bus enquires and services". Plymouth City Council. Retrieved 16 November 2008. ^ "Park and ride". Plymouth City Council. Retrieved 16 November 2008. ^ "Plymouth Ferry Terminal Guide". Brittany Ferries website. Retrieved 11 April 2009. ^ "Cremyll ferry". Plymouth City Council. Retrieved 16 November 2008. ^ "Mount Batten Ferry general info". Mount Batten Ferry website. Retrieved 16 November 2008. ^ "Torpoint ferry". Plymouth City Council. Retrieved 16 November 2008. ^ "View of the aircraft parking area and runway at Plymouth City Airport". The BBC. Retrieved 16 November 2008. ^ "About Us". Air Southwest. Archived from the original on 11 October 2008. Retrieved 16 November 2008. ^ "Plymouth City Airport Flights". Plymouth City Airport. Archived from the original on 28 October 2008. Retrieved 16 November 2008. ^ "Air strategy for the far South West published". The South West RDA. 6 June 2003. Retrieved 16 November 2008. ^ "New blow for city airport". BBC News. 7 June 2003. Retrieved 16 November 2008. ^ "Plymouth City Airport to close in December". BBC News. 28 April 2011. Retrieved 30 December 2011. ^ "FlyPlymouth vows to reopen Plymouth City Airport within two years". Plymouth Herald. 8 May 2015. Retrieved 2 June 2015. ^ "Plymouth Station celebrates 130th birthday". First Great Western. 28 March 2007. Archived from the original on 15 November 2008. Retrieved 16 November 2008. ^ "Station Facilities: Plymouth (PLY)". National Rail Enquiries. Retrieved 16 November 2008. ^ "Plymouth ---> Gunnislake Train Timetable" (PDF). Network Rail. Retrieved 17 May 2008. ^ Webster, Ben (25 February 2006). "Biggest cuts since Beeching will slash rural train services". The Times. London. Retrieved 31 May 2008. ^ "MPs join forces against train cut". BBC News. 26 June 2005. Retrieved 31 May 2008. ^ "UK storms destroy railway line and leave thousands without power". BBC Online. 5 February 2014. Retrieved 5 February 2014. ^ "Devon coast to coast | Britain's best bike rides". The Guardian. 4 May 2012. Retrieved 14 September 2017. ^ a b c "Places of worship". Plymouth City Council. Retrieved 2 September 2008. ^ "Plymouth Cathedral 1858–2008: 150th Anniversary Celebrations". Roman Catholic Diocese of Plymouth. Retrieved 2 September 2008. ^ "Christian". Plymouth City Council. Retrieved 2 September 2008. ^ "The Exclusive Brethren History". The BBC. 4 February 2004. Retrieved 13 July 2008. ^ "Synagogue, Catherine Street, Plymouth". English Heritage. Retrieved 22 November 2008. ^ "Other faiths, religions and beliefs". Plymouth City Council. Retrieved 2 September 2008. ^ "Religion, 2011". Office for National Statistics. 30 January 2013. Retrieved 17 July 2013. ^ "Religion, 2001". Office for National Statistics. 18 November 2004. Retrieved 17 July 2013. ^ a b c "Union Street: night and day". The BBC. 24 July 2006. Retrieved 22 June 2008. ^ Morris, Jonathan (14 November 2008). "Haven for casualties of the night". BBC News. Retrieved 16 November 2008. ^ Else, David (2007). England. Lonely Planet. p. 340. ISBN 1-74104-567-3. Retrieved 16 November 2008. ^ "The British Firework Championships Plymouth". The British Firework Championships website. Archived from the original on 14 October 2008. Retrieved 2 November 2008. ^ Pascoe, Ben (2 November 2006). "Rocket man sets record". The BBC. Retrieved 21 June 2008. ^ "MTV Crashes Plymouth artists | MTV UK". Retrieved 5 February 2018. ^ "About Music Of The Night". Music of the Night. Archived from the original on 5 October 2008. Retrieved 16 November 2008. ^ "Plymouth Art Weekender | 22 / 23 / 24 September 2017". plymouthartweekender.com. Retrieved 5 February 2018. ^ "Home". Plymouth Fringe Festival. 18 March 2016. Retrieved 5 February 2018. ^ "Illuminate - Ceremony in Plymouth, Plymouth - Visit Plymouth". www.visitplymouth.co.uk. Retrieved 5 February 2018. ^ "Theatre Royal". The Theatre Royal. Archived from the original on 22 December 2008. Retrieved 16 November 2008. ^ "Drum Theatre". The Theatre Royal. Archived from the original on 22 December 2008. Retrieved 16 November 2008. ^ "TR2". The Theatre Royal. Archived from the original on 25 October 2008. Retrieved 16 November 2008. ^ "About Us". The Plymouth Pavilions. Archived from the original on 22 August 2008. Retrieved 16 November 2008. ^ "Cinemas". Plymouth City Council. Archived from the original on 9 June 2008. Retrieved 17 November 2008. ^ "Home". Barbican Theatre Plymouth. 11 October 2012. Retrieved 5 February 2018. ^ "The B-Bar, Barbican, Plymouth". www.b-bar.co.uk. Retrieved 5 February 2018. ^ "The Plymouth Athenaeum Library". Independentlibraries.co.uk. Archived from the original on 3 December 2014. Retrieved 11 November 2014. 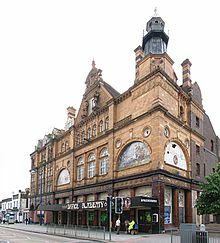 ^ "Plymouth City Museum and Art Gallery". Plymouth City Council. Retrieved 17 November 2008. ^ "Spotlight (address footnote)". BBC South West. Retrieved 17 November 2008. ^ "The end of an era: Last night for Westcountry TV". The Herald. 13 February 2009. Archived from the original on 14 February 2009. Retrieved 4 April 2009. ^ "Creative Sector". Plymouth City Council. Retrieved 17 November 2008. ^ "Divisional League Table". The Football League. Archived from the original on 13 April 2014. Retrieved 31 August 2008. ^ "History of Plymouth Argyle". The BBC. 18 February 2008. Retrieved 31 August 2008. ^ "History of Plymouth Albion RFC". Plymouth Albion R.F.C. website. Archived from the original on 31 May 2008. Retrieved 21 June 2008. ^ "History". Plymouth Raiders website. Retrieved 10 July 2016. ^ "Plymouth hosts America's Cup World Series". The BBC. 23 February 2012. Retrieved 10 March 2013. ^ Moseley, Brian (14 January 2013). "Water Supply to Plymouth". The Encyclopaedia of Plymouth History. Plymouth Data. Archived from the original on 16 October 2013. Retrieved 13 February 2015. ^ Moseley, Brian (8 July 2011). "Water Supply to Plymouth Dock/Devonport". The Encyclopaedia of Plymouth History. Plymouth Data. Archived from the original on 17 May 2013. Retrieved 13 February 2015. ^ "The History of Dartmoor". 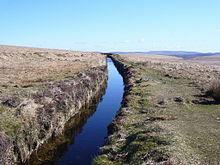 Dartmoor National Park Authority. Archived from the original on 13 December 2007. Retrieved 31 August 2008. ^ "Rubbish and recycling". Plymouth City Council. Retrieved 31 May 2008. ^ "About SWW". South West Water. Retrieved 31 August 2008. ^ "Western Power Distribution home page". Western Power Distribution. Archived from the original on 9 June 2008. Retrieved 31 August 2008. ^ "Power station delayed for a year". BBC News. 6 March 2009. Retrieved 27 March 2009. ^ "Magistrates' Court search". Her Majesty's Courts Service. Archived from the original on 7 January 2009. Retrieved 17 November 2008. ^ "Combined Crown and County Court search". Her Majesty's Courts Service. Archived from the original on 6 January 2009. Retrieved 17 November 2008. ^ "Our History – Devon & Cornwall Constabulary". Devon and Cornwall Constabulary. Retrieved 10 July 2016. ^ "Welcome to Plymouth City Centre & Waterfront – Devon & Cornwall Constabulary". Devon and Cornwall Constabulary. Archived from the original on 19 August 2016. Retrieved 10 July 2016. ^ "Your Local CPS: Devon and Cornwall". The Crown Prosecution Service. Retrieved 16 February 2008. ^ "West Devon". Devon and Somerset Fire and Rescue Service. Archived from the original on 4 July 2007. Retrieved 1 September 2008. ^ "Plymouth Fleet". Royal National Lifeboat Institution. Retrieved 24 March 2009. ^ "Plymouth Hospitals". Plymouth Hospitals. 29 August 2008. Retrieved 24 February 2013. ^ "Welcome to the South Western Ambulance Service NHS Trust website". The South Western Ambulance Service NHS Trust. Archived from the original on 12 June 2008. Retrieved 17 November 2008. ^ "Drake Memorial Park". The Drake Memorial Park. Retrieved 16 May 2010. ^ "Coast Walks: Point 5 – Smeaton's Tower". The BBC. 25 January 2008. Retrieved 5 July 2008. ^ "Smeaton's Tower". Plymouth City Council. Retrieved 3 September 2008. ^ "War memorials". Plymouth City Council. Retrieved 2 September 2008. ^ "Plymouth's Historic Barbican". The BBC. 18 February 2008. Retrieved 16 November 2008. ^ "Point 8a – Mayflower Steps". The BBC. 7 January 2008. Retrieved 5 July 2008. ^ "Our mission is to inspire everyone to take action towards sustainability and conservation of the marine environment". National Marine Aquarium. Archived from the original on 4 September 2009. ^ "Saltram". The National Trust. Archived from the original on 10 June 2008. Retrieved 6 July 2008. ^ "Crownhill Fort". The Landmark Trust. Retrieved 17 September 2012. ^ "Devonport Heritage Trail". DevonportOnline. Retrieved 29 April 2011. ^ Gemma Thompson. "Plymouth City Council – The countryside". Plymouth.gov.uk. Retrieved 17 September 2012. ^ "10 of the most beautiful university buildings in the UK". Times Higher Education. Retrieved 16 October 2014. ^ "Kier tops out at Plymouth's Beckley Point". Retrieved 23 September 2018. ^ "Go-ahead for Plymouth's tallest building". Retrieved 23 September 2018. 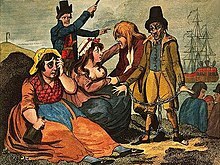 ^ "Anger over slave trader pub name". BBC News. 27 March 2008. Retrieved 27 October 2009. ^ Routledge, Cyril Tawney; Kegan Paul (1987). 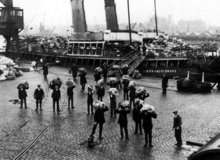 Grey Funnel Lines: Traditional Song & Verse of the Royal Navy, 1900–1970. London: Routledge & Kegan Paul. ISBN 978-0-7102-1270-2. ^ "Sir Francis Drake". BBC. Retrieved 3 December 2008. ^ Rasor, Eugene (2004). English/British Naval History to 1815: A Guide to the Literature. Greenwood Publishing Group. p. 190. ISBN 0-313-30547-1. Retrieved 2 September 2008. 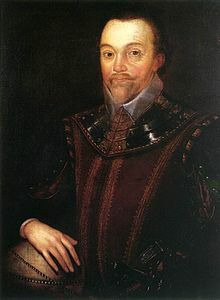 ^ "Sir Francis Drake (c.1540 – c.1596)". The BBC. Retrieved 31 August 2008. ^ "Mission to rescue Drake's body". BBC News. 12 November 2001. Retrieved 27 October 2009. ^ "Robert Falcon Scott". The BBC. Archived from the original on 6 January 2008. Retrieved 31 August 2008. ^ "Antarctic explorer Frank Bickerton". BBC. Retrieved 8 June 2008. ^ "Painter Beryl Cook dies aged 81". BBC News. 28 May 2007. Retrieved 8 June 2008. ^ "Controversial artist". BBC. 30 January 2008. Retrieved 31 August 2008. ^ "Music – Cosmo Jarvis". BBC. Retrieved 24 February 2013. ^ "Gilbert & George Britannica Online Encyclopaedia". Britannica Online Encyclopaedia. ^ "Thomas Daley Biography". The British Olympic Association. Retrieved 12 February 2007. ^ "About Sleep". Wayne Sleep's website. Archived from the original on 19 September 2008. Retrieved 31 August 2008. ^ "Trevor Francis". Sporting Heroes. Retrieved 10 July 2016. ^ "Plymouth's movie maestro". BBC. 30 January 2008. Retrieved 31 August 2008. ^ "The talented Angela Rippon". This Is Hampshire. 19 August 2000. Archived from the original on 25 July 2009. Retrieved 31 August 2008. ^ "Donald Moffat Biography (1930-)", Filmreference.com. Retrieved 15 December 2013. Dunning, Martin (2001). Around Plymouth. Frith Book. Carew, Richard (1555). The Survey of Cornwall. N.B. Carew refers to Plymouth Hoe as "the Hawe at Plymmouth"
Wikimedia Commons has media related to Plymouth. Wikivoyage has a travel guide for Plymouth.